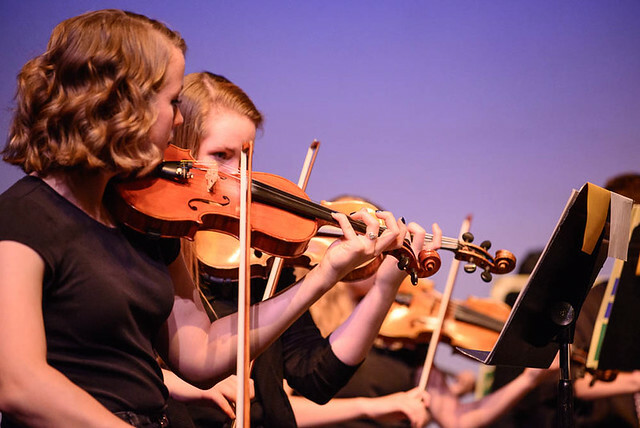 I attended a student orchestra concert last week at the high school. 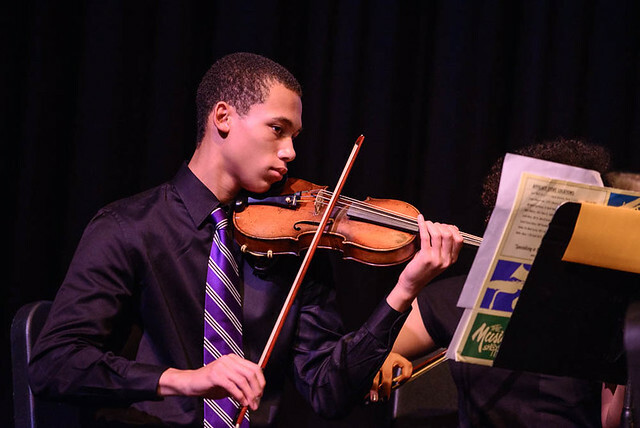 While I don't have direct ties to the orchestra program, I still play the violin and enjoy listening to live classical music, especially music created by young artists. I guess it brings me back to my own high school orchestra days. The program included string players from the 6th grade, whose skills are still quite basic, all the way to the High School orchestra. The wide breadth of musical ability across the performer displayed the years of practice it takes to play an instrument well. I had this musician picked out as the most technically advanced of the high school students. Sure enough, later on in the program he performed a solo. I love the rich sound of the cello. I think if I were to pick up another stringed instrument, this would be it. I noticed her black fingernail polish - something I would never do with mine! Congrats to all the performers - they did a great job! Like the close ups of the cello. 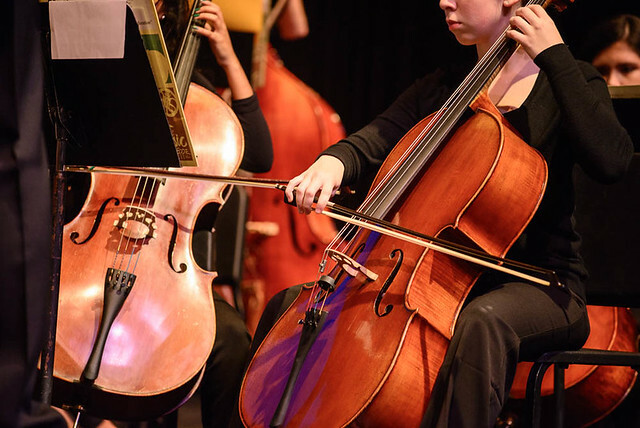 Isn't it a joy to see young musicians in concert? My six-year old granddaughter began violin lessons a few weeks ago and also was selected for the community children's choir. I can hardly wait to see their first concert in November! What a great evening this must have been, and only 6th grade?? Some of them look much older. Yes, isn't it exciting to see these young musicians and know they are learning and enjoying music?! I teach piano and love watching when something "clicks" for the students. I know music will enrich their lives. You got some great shots of the musicians! You got some seriously good photos. 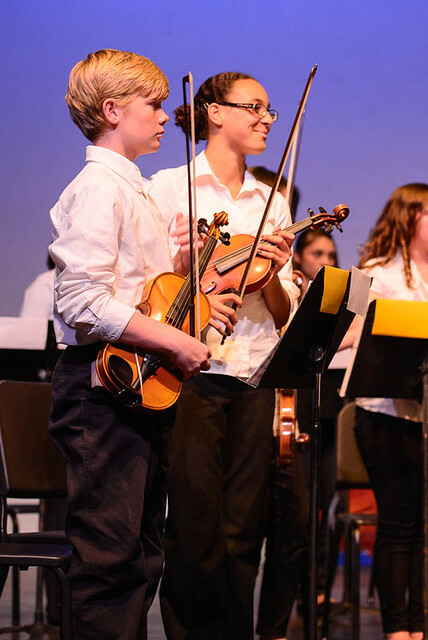 I love hearing the kids perform (not necessarily mine - one played clarinet for a few years and was pretty decent with good potential- unfortunately it was middle school and there was no discipline with all the students so all the songs ended up sounding like 3 Blind Mice. My other child had no interest possibly because he had suffered through his sister's concerts. As for the black polish, you should try it. I went with a dark chocolate brown and loved it. Black is the new red. Beautiful images Shirley...and ohhh I love the sound of the cello too. Must have been so nice to sit back, relax and just listen to the children play (without the stress of having to be up there yourself :) I used to play the flute, but have long forgotten how... I think it's wonderful you still play your violin! I've always admired anyone who learns to play the violin well. I too have always love the rich sounds of a cello.